Last month, I finally bit the bullet and upgraded my TiVo Series 2 DVR to the newest and greatest TiVo Premiere . Despite some mixed reviews including one by the famed Walter Mossberg, I went ahead with the purchase. I was tired of not being able to record in HD, and I was also able to get rid of my cable converter box from RCN using the TiVo and CableCard combo instead. I have to admit that a big selling point was the pending release of the TiVo for iPad app, something that the company has been touting on their website since early November. Well, the day has finally arrived as the app officially hit the App Store earlier this week. More thoughts, screenshots and a hands-on look after the jump. Some of my current complaints with TiVo Premiere after just one month are the slow menu interface, the teasing HD design for only some of the menus, and the lack of a keyboard when searching for shows. Now, I know that TiVo released a separate remote with a slide out keyboard , and while I do love slider devices, I'd rather go with the price of zero instead of shelling out $65 for a remote. Slow menus may be a thing of the past, as the iPad experience (when working - more on that later) is smooth and I'm able to access TiVo menus much quicker than through my television. The design interface is polished for the most part, and the search bar integrates the onscreen keyboard well. The five tabs on the bottom feature Info, Guide, My Shows, Browse, and Manage. The Info tab reveals what's currently playing on either of the dual tuners, and gives you options to record or stop recording, view what's coming up, and offers suggestions for other programming. While here, I'll point out one of the coolest features found in the upper right of the app on all tabs: the onscreen remote. With the included buttons, you can quickly change channels, switch tuners, and best of all, quickly scrub through an episode or just fast forward/rewind as usual. There's even a keyboard button, but I haven't found a use for this as of yet. 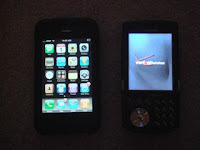 What's conspicuously missing, though is a power button and volume controls. 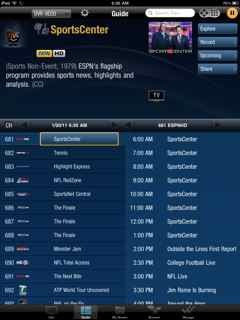 The Guide Tab features a list of 12-13 channels that is scrollable and tapping on a selection in the left column brings up an info panel up top and the day's schedule on the channel in the right column. This tab is essentially the same as the guide button on the TiVo, except that it is faster, smoother, and it does not need to go on top of your screen. Browsing the TV guide on the iPad is now an enjoyable experience and I can check on upcoming sports events without interrupting my wife's viewing of the most recent episode of Ellen. The My Shows button brings up a list of all shows stored on your DVR including all of the TiVo Suggestions you may or may not have. Again, the top panel displays information about the show allowing you to watch now (impressively fast switch), explore (find more similar shows), delete (very useful), view any upcoming episodes, or share. 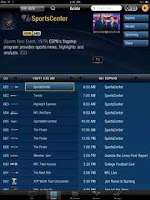 I find the delete button to be particular beneficial, as I can now manage the storage situation on our TiVo from anywhere in the house, at any time, and with a much less clunky interface. This is a huge improvement over the standard TiVo experience. The Browse button allows you to search for something to watch if you don't already have enough to catch up on your DVR. 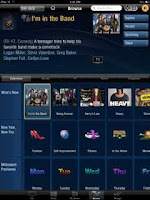 A wide array of categories ranging from Drama TV to Anime TV fill the bottom half of the iPad screen. 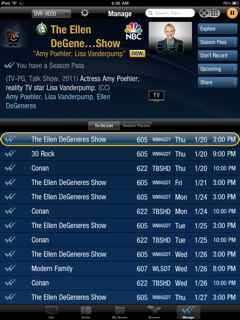 Each is scrollable horizontally to feature more screenshots of shows, and each show is clickable to reveal more information in the upper panel. This screen is where I tested the search bar, and sure enough I was able to find a movie that was available on Netflix. What I couldn't figure out was how to begin watching a Netflix movie as the "Get From" button led me to a blank preview box. Lastly, the Manage tab allows you to see what's on the TiVo To Do List, and you can make adjustments including telling it not to record, or explore similar shows. Your Season Pass list can be reordered, modified, and shows can be canceled all from this menu. Speaking of Season Passes, any show that you pull up in the info panel can be added with a Season Pass and all of the options (quality, number of episodes, first-run/repeats) are available from the iPad app. Again, this is a huge improvement as the TiVo standard experience remains slow and borderline frustrating. OK, When's the First Update? 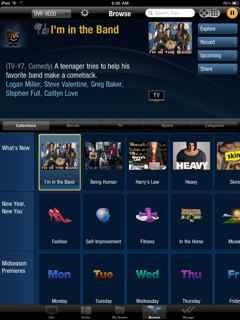 All is not rosy for the TiVo iPad app, and there are still improvements to be made. 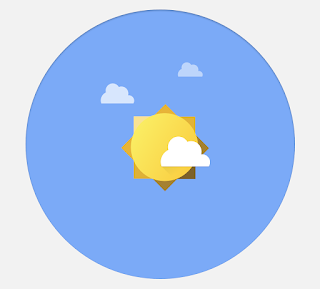 First, I was among a number of users to experience a ton of spinning circles when first using the app. This rendered the app nearly unusable, and I was a bit concerned. However, a quick trip to a TiVo support forum revealed a conflict between Bluetooth and the WiFi signals, and when I turned BT off on the iPad, the TiVo app sprang to life with the snappiness that I was hoping for. Still, for those who regularly use a Bluetooth peripheral with their iPad, this is not a good solution, and I suspect a fix will be topping the list of any forthcoming update. 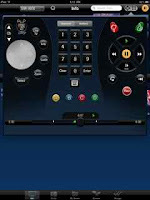 The missing remote control buttons mentioned at the beginning of this post is another disappointment, as I still need to find my real remote to turn the TV on/off and adjust the volume. Lastly, the dead end when trying to view a Netflix title was a minor flaw that may be corrected in the future as well. While we're on the subject of dreaming for a better iPad app, I might as well throw out the idea of watching one screen on my iPad while still having content stream on the television. 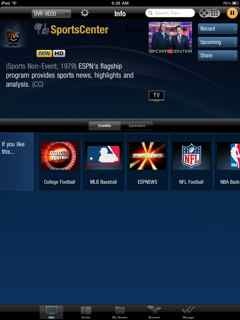 Essentially, I can do this already with my Slingbox setup, but wouldn't it be cool if it was seamlessly integrated into the TiVo app? Can't a techie geek dream? Overall, once I switched the Bluetooth off, the TiVo iPad app lived up to my high expectations and can be deemed "worth the wait." I will call this app the ideal companion app and not a replacement remote since it's still unwieldy to use an iPad instead of a handheld device. 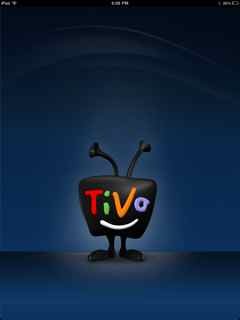 App developers can take notes from the overall experience that TiVo has created for its end users, as it is outstanding. Will a less featured iPhone or Android app be next? 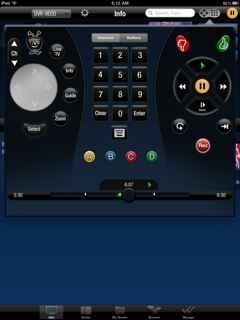 The TiVo for iPad App is available for free in the App Store. Please note that a TiVo Premiere DVR is required.